The start of the hunt takes place at Place Massèna, precisely at the Fountain of Apollon (Fontaine d’Apollon). An organizer will be waiting to welcome all the participants. 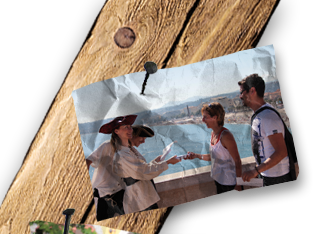 On reading this you will discover the history of our beautiful city of Nice, as well as that of the pirate Black Morgan and, through various stages, you will go from one point to another. Participants must make a journey on foot, search for landmarks, find junction points with the help of our disguised assistants and solve various puzzles. Throughout the circuit, players will meet organizers who will submit various informative fun games,riddles, and quizzes to win in order to obtain a clue. These games could be given orally, by photo, a map,or a scroll which enables players to take the right directions in order to continue the adventure. So, step by step, with questions, clues and unexpected happenings : the teams should reach the treasure trove.